If your online portfolio is ready to be seen and admired, but no one seems to be looking, you need to market your marketing. It may seem daunting, but it’s easier than you think. You know why? You are marketing something that you know better than anyone else in the world. We’ll show you how to gain traction by taking just three steps. Step One: Every marketing professional needs a personal unique selling proposition. Marketing your online portfolio is more than showing your work. You’re showing yourself as well. So what makes you “you”? How would you describe your work? How would someone else? What sets you apart and makes you different from and better than the competition? The answer is your personal unique selling proposition (USP). This is a sentence or two, not an essay, so it may be a bit difficult to identify; but think about—hone it and own it because your personal USP because will help shape your marketing strategies. Step Two: Your creative work needs to have business sense behind it. Experts in the field have suggested success in marketing is 20% about your creative work and 80% about the work behind the scenes. If you have a great portfolio and you’re not seeing results, chances are your business approach needs some attention. Here are a couple ways how to do that. Blog with Purpose. Remember your creative voice? Your blog needs to be developed from your comfort zone. Write about what you believe in and what excites you. Blogs should be brief and accompanied by high-resolution images of your visual work if possible. To get the most from your blog, think about search engine optimization (SEO). Search engines reward websites with regular activity, so blogs are a great way to keep your site fresh and help you attain a higher Google ranking. Also, do some quick research and discover the most searched topics in your field. If they align with your creative voice, develop targeted blog posts on these subjects. Pitch Yourself and Your Work. The 24-7 monster that is the internet needs to be fed constantly. Rather than waiting for a publication to contact you, contact them. Seeing your name in the byline is something that never gets old. Start small and research appropriate channels for your work. Develop a strong, confident pitch that incorporates your personal USP—remember, you’re selling them on you just as much as your work. Define your style and stick to it. Find and follow the submission guidelines and pitch. You will probably hear “no” or nothing a few times before you hear a yes, but be tenacious and resilient, and it will come. Then, after you have a byline or two, be sure to make that part of your future pitch. Pay special attention to those publications that actively solicit submissions. This way, you know they want to see your work and use it if they can. Finally, remember your pitches have the potential to build new relationships and make sound business contacts, so be sure be to build bridges rather than burning them. Join forces. If you’re a creative professional trying to gain a foothold in your field, it may make sense to collaborate and cross-promote your work. Working with another creative person is a great source of inspiration; it can bring out your best and let you discover new approaches. The best hybrid is teaming up with creative professionals who work in non-competing, complementary fields—yet still are targeting the same markets or client bases. For example, writers teaming up with graphic designers or strategists with visual artists. Even if you’re not interested in a direct collaboration, you can still cross-promote your portfolio by simply adding a “Check This Out” page to your online portfolio and include the links to other portfolios. Ask them to reciprocate and you can reach new audiences and help your friends do the same. Step Three: Don’t get lost in your social media presence. Having a great online presence may be a requisite to success, but don’t forget we live in a non-digital world too. All the social media connections in the world cannot replace the value and effectiveness of old-fashioned face-to-face networking. So after you get your online portfolio just how you want it, turn off all your electronics and leave your home. Go out and interact with other human beings. Go to networking events, conferences, book readings and seminars. Many of these activities are free. Be bold. Be curious. Shake people’s hands. As a marketing professional, you need every people skill you can muster, and the best way to make that happen is to get out there and interact with real people and let them see the real you. 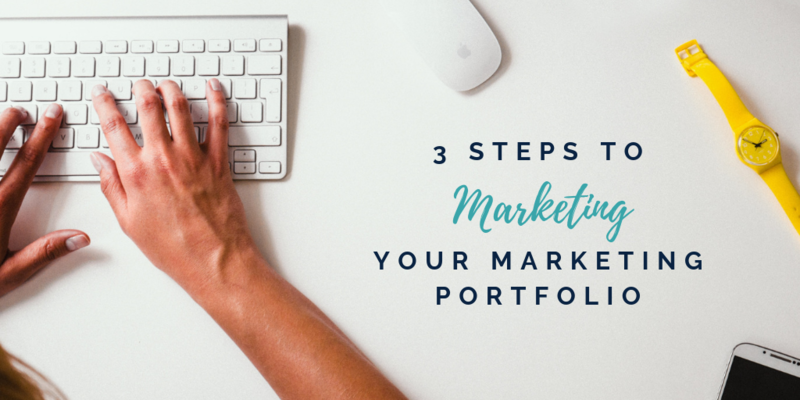 Knowing where to turn after developing your marketing portfolio can be overwhelming, but there are plenty of ways to get your name out there! If you’re looking for a new position, reach out to us today. We’d love to connect you with an awesome company!